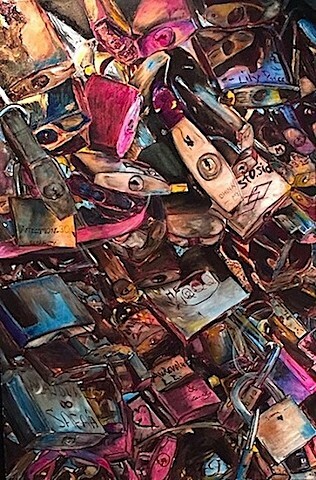 “Love Locks” expresses the push and pull of love from soft warmth to the sharp pangs of admiration and affection against a background of saying ‘au revoir’ to the love locks on Pont Des Arts bridge in Paris, which were removed by the city in 2015. This piece exemplifies my use of color and creative texture. I derive inspiration from the natural world as well as my family’s heritage of both Eastern and Western influences.